In Thailand, houses are protected by spirit houses (San Phra Phoom and San Jao Tee), larger buildings and villages are protected by Brahma shrines (San Phra Phrum/San Phra Brahm). Thai cities, more specifically the provincial capitals of Thailand are protected by the City Pillar. also known as Lak Mueang, “Lak Myan”. The City Pillar is the home to the guardian spirit of the city, known as “Chao Pho Lak Mueang”. The City Pillar is usually centred in the historical centre of the city. 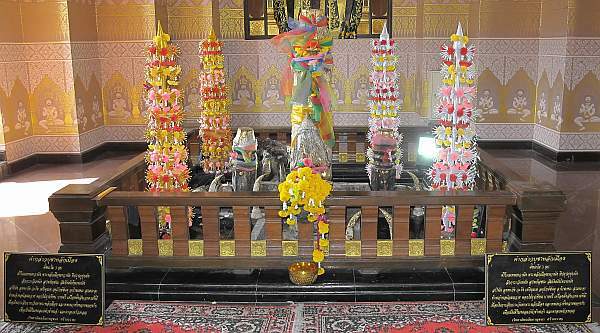 On a grand scale the Thai City Pillars have a lot in common with spirit houses, they both house guardian spirits, both consist of a stake being driven in to the ground, offerings are made and favours asked for. So it’s fair to say that just like spirit houses, city Pillars are an animist belief (animism = spirit worship). Spirit worship may sound a little old fashioned and outdated, but in Thailand the belief in ghosts and spirits is as strong as any religious belief. City Pillar Shrine (Lak Mueang) in Buriram Thailand. 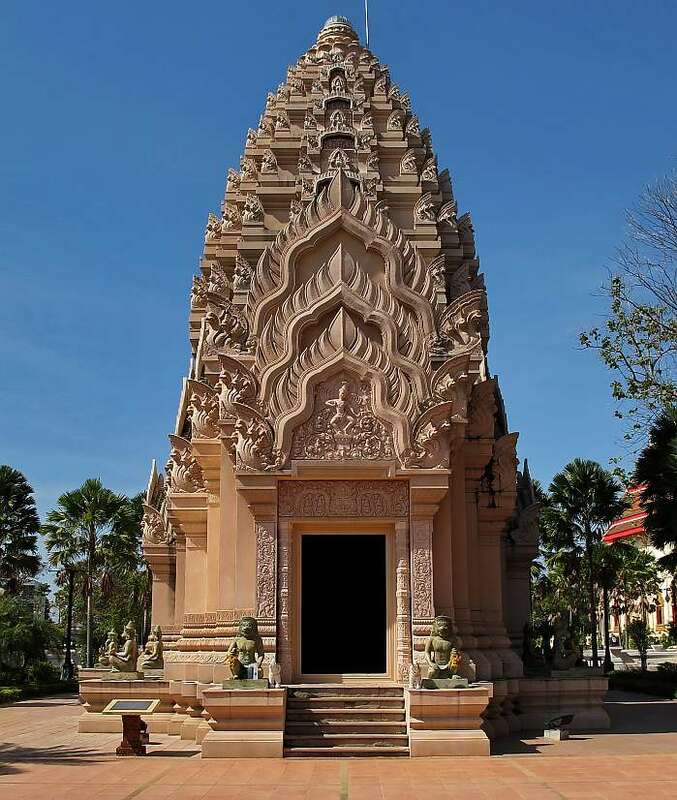 The City Pillar shrines of Thailand may vary in size from province to province, and the architectural style of the building is usually influenced by the provinces historical background, be it Khmer (Cambodian), Hindu or Chinese. The City Pillar Shrine pictured (above) is in Buriram, North-east Thailand (Issan), the style of the shrine is very much in keeping with the Khmer history of North-east Thailand, you will see that the architecture of the Buriram City Pillar Shrine is very similar to that of the most famous historical landmark in North-east Thailand “Phanom Rung Temple“. Like a Brahma Shrine, the City Pillar Shrines of Thailand are exposed on the four cardinal directions (north, east, south and west) so that the City Pillar is visible from each side. Inside the building is the actual City Pillar contained within an altar. Carved Wooden City Pillar, Buriram Thailand. The City Pillars are usually made of hard woods commonly found in Thailand, such as teak-wood or cassia, but can also be made of stone. They are driven in to the ground and most often they will be about 2 meters high, wooden city pillars are carved from a solid log. Most Thai City Pillars are domed at the top so that they resemble a phallus (much like a Phalad Khik). 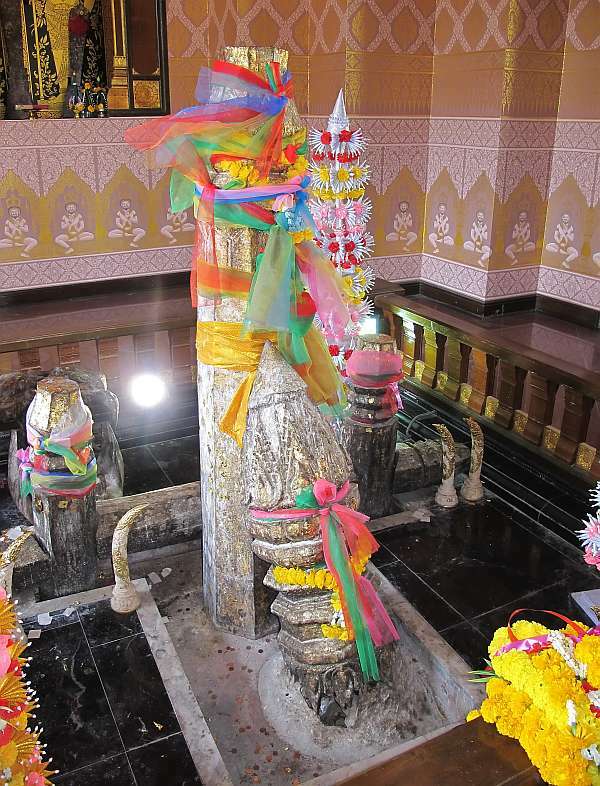 It is not exactly clear why the City Pillar takes the form of a phallus, it may be loosely connected to Shiva, or it may be because the guardian Spirit (Chao Pho Lak Mueang) is a male. It is this 2 metre high pillar which, according to folklore houses the Guardian Spirit. Thai people will often visit a City Pillar Shrine to ask a favour of the Guardian Spirit, after asking for this favour they must in turn promise a gift or a deed in return. The Guardian Spirit is also highly revered and feared, in the same respectful way motorists beep their horn to show respect to the spirit of a sacred fig tree, they may raise their hands to Wai the Guardian spirit as they pass. 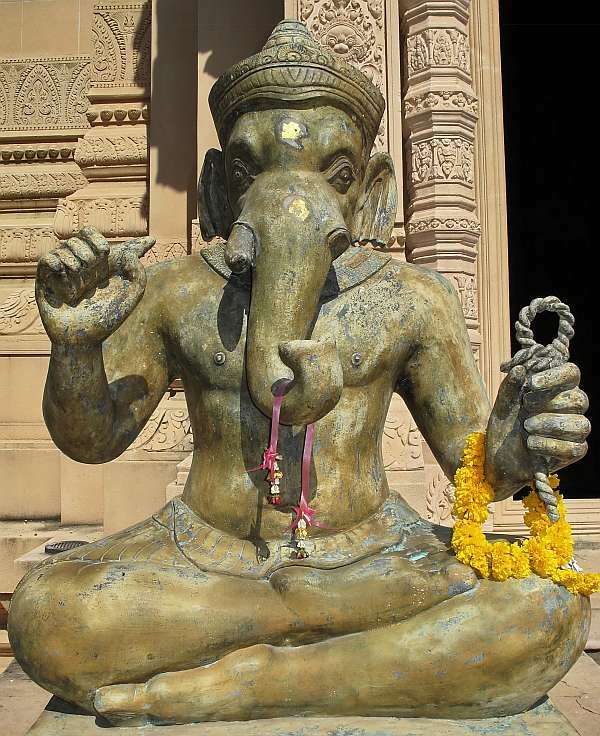 Another close link to the architectural style of the Buriram City Pillar “Lord Ganesh“, a Hindu deity. Reputedly the first and most important City Pillar in Thailand is the one in Bangkok, it was erected in 1782 by Phra Buddha Yodfa Chulaloke, the first king of the Chakri Dynasty. On the auspicious date and time of 06.45, April 21st 1978 under the guidance of the King’s astronomers, the stake was driven into the ground. The Government ordered that every provincial capital of Thailand should have a City Pillar Shrine, that was in 1992, today there are still some provinces without one. A myth from one province suggests that government officials were sent to call 4 names, the first 4 people to answer the calls were buried alive underneath the pillar. Also known as Lag Myan or Lak Myan. In Chiang Mai it is also known as Inthakhiila (Indra’s Post). Summary of Thai City Pillars. The importance of City Pillars is emphasized by the governments demand for one in each of Thailand’s provincial capitals, no expense is spared in their construction, and the selection of a site often means demolishing an existing building. The existence of animism (spirit worship) is present in all levels of Thai society, hand in hand with Buddhism and Brahmanism (Hinduism) it is one of the fabrics of Thai society. City Pillars are an extended protection for the city, and an outlet for it’s citizens.